LeBron James hit the jackpot Wednesday night. The USA TODAY basketball player of the year from St. Vincent-St. Mary High (Akron, Ohio) signed a multiyear deal with Upper Deck trading cards and hours later inked a seven-year shoe contract with Nike. The seven-year shoe deal is worth more than $90 million, The Associated Press learned Thursday. ESPN.com said James will receive $1 million a year for five years for his image on trading cards. A star guard for the NBA's (National Basketball Association) Cleveland Cavaliers, LeBron James, commonly nicknamed "King James," was a high school phenomenon and named Ohio's "Mr. Basketball" three times. He skipped college to join the NBA in 2003, the same year he signed a $90 million endorsement deal with Phil Knight's Nike shoe company. 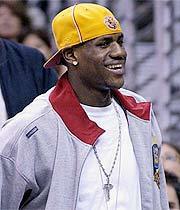 He was the NBA Rookie of the Year (2004) and was four-time All NBA (First Team: 2006, 2008 and Second Team: 2005, 2007). He joined the NBA All-Star in 2005, 2006, 2007, and 2008, and was NBA’s All-Star Game MVP in 2006 and 2008. He became NBA’s Scoring Champion in 2008.